A T-Tapp Video Gift Just for YOU!!!! This video gift is to help YOU become your very own success story. The form tips here can be used to get the most out of any workout you ever do. Movement is one of the best medicines we have available. I believe in using this wonderful method of movement as a “medicine” to nourish and heal us. NOT to use it as a punishment for being “bad” by not working out or not doing it “perfectly”. T-Tapp is a fabulous method of movement and an education in body alignment and muscle activation. It can take time to “get it into your body” in a way that helps you get the most out of all your workouts and really…out of all the movement you do in your day! 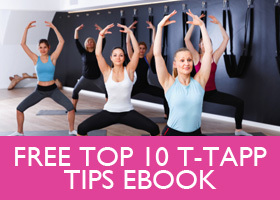 Click HERE to go to my “Tappers T-Tapp Tips” Facebook Group. Ask to join to receive extra support, inspiration and motivation! Click HERE to go to my Inspiration page where you can hear the interviews I did with the 60 Day Challenge winners. GREAT tips and inspiration on this page. Bookmark it so you can return as you go through your own Challenge! Ready for your 7 Video Form tips? These are best watched in order. Tip #3: Hand away and the power of “Ribs up”! I hope you have found the tips, tweaks and tools in this gift package helpful! T-Tapp is an incredible method of movement and the more you slow each move down and focus on your form (this doesn’t mean getting it all perfect) by connecting your brain to your body…the quicker results will come. Your mission, should you choose to accept it…is to keep doing the moves with focused intention. Allow the body to respond as it does. Sometimes it doesn’t respond as quickly and in the way you necessarily want it to. There can be many reasons for this. I have found most often it’s because you are actually healing at a deep cellular level. You are activating the lymphatic system and that is the body’s trash can. Lot’s of toxic waste is being circulated and eliminated. This is why T-Tapp has been called “an elimination” workout. Want to know when T-Tapp won’t work??? When you stop doing it!!! That is a certainty! If you want T-Tapp to work…you have to work T-Tapp. Or… I like to think we have to play at T-Tapp. I’d love that. You can either take a Stretch and Sculpt or Gentle Somatic Yoga class with me LIVE Online (via Zoom) or you can get one of my Recorded class packages. These packages consist of classes I recorded live and are making them available to you to do when your schedule permits. I also do live one-on-one Personal Training (imagine the results you’d get working directly with a Master T-Tapp Trainer!). Click here to schedule your first 50 minute personal training session! If you are a T-Tapp “newbie” and want more T-Tapp form tip classes, checking out my Form Tips Clinic. I did a live 4 hour Form Tips Clinic and am making these recordings available to you. If you’ve always wanted to go to a T-Tapp Clinic to learn how to get better results…this is your chance! I put this bigger package together to give you tons of form tip classes (including moves from Total Workout. It also has “regular” classes designed to help you put all your tips to work! Beginners “get started off right” T-Tapp package. If you don’t have a ton of time to workout (and let’s face it…how many of us really want to spend more than 30 minutes getting our T-Tapp on?? ), check out my “Short and Sweet” Recorded Class Package. Not sure the best way for you to begin your journey??? I also offer free 15 minute chat sessions. I’ll give you a call and we can chat about the best ways for YOU to get started. Click Here to schedule your chat!